On this page you will find the technical information for building the electronic control unit of my homemade film processing machine. To see the rest of this film developing apparatus, look at the relevant article in the photography section of this site. Developing a color film is a simple procedure of putting it in a sequence of several chemical baths, for reasonably precise times at reasonably precise temperatures and with sufficient agitation. It can be done by hand, but when one has to develop films pretty often, that soon gets old! And there is another large advantage to a processing machine: Consistency. With a machine, the process will be exactly the same every time, so there are no nasty surprises with under- or overdeveloped films, color shifts, and the like. This machine essentially does three things: It controls the process temperature, provides constant agitation of the chemical baths, and performs the timing. The operator must pour in and out the liquids by hand. Here is the schematic diagram of the controller. You can click on it to obtain a 600dpi version for high quality printing. The heart of the circuit is a Basic Stamp 2p microcontroller. It has a program loaded that contains several film processing algorithms. For each of them, the process temperature, the bath sequence, the bath names, and durations, are stored. 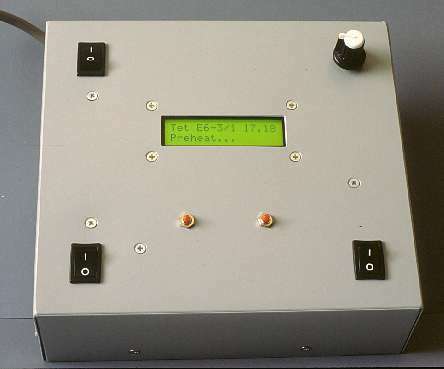 The program offers the options via a menu, displayed on a 16x2 character alphanumeric backlit LCD, while user input is through two pushbuttons. A small speaker gives confirmation beeps, and is also used to signal the end of the process time for each bath. The processor reads a Dallas DS18S20 digital temperature sensor, which is immersed in the water bath, and uses this information to display the temperature on the LCD, and to control the phase angle of conduction for the heater. For this purpose, a proportional-integral control characteristic is implemented in software. This routine generates an analog output value, which is output on a digital pin through pulse width modulation, and used in an extremely simple but effective optocoupled phase control circuit. 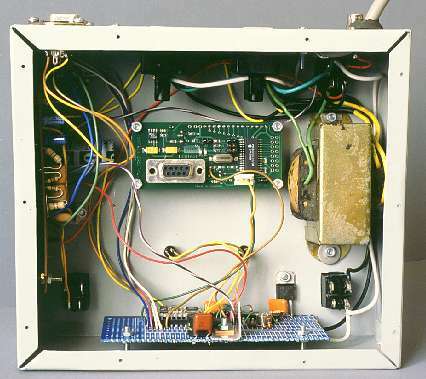 The power device is an insulated-tab TRIAC which can be mounted directly to the metal box of the processor. This TRIAC can easily control de machine's 2000 Watt heater. Rotation control is implemented completely separate from the microprocessor. 555 chips are so cheap that it's not worth the effort to put the rotation control routine into the Basic Stamp, which would generate some difficulties with precise timekeeping, since the Stamp has no realtime multitasking. And anyway the power and interface circuit would be necessary. So I used two 555 timers, connected in such a fashion that the rotation motor runs 30 seconds to one side, then stops for one second, runs 30 seconds to the other side, stops, and so on. To control the rotation speed, the entire "reversomatic" circuit is powered from an adjustable voltage regulator. This IC must be mounted with insulation, as its tab is connected to the internal circuit. A simple switch is used to enable or disable rotation. The power supply for the electronics is totally conventional. There isn't much to say about it, except that an auxiliary 12V input is provided. You can connect any 12V battery here. During normal operation, the internal voltage is higher and the battery will just sit there, but in the event of a power failure the battery keeps the electronics running, thus saving your film from suspended processing! Depending on the likelihood of power failures in your area, this can be an important feature. The heater of course stops working when the power fails, but given the large thermal mass of the 30 liters of water used in this processor, the temperature holds stable enough to complete processing without severe degradation. Two DIN connectors are used for the rotator deck and the temperature sensor. They are wired in such a way that accidental connection of the wrong device to an outlet will not cause any damage. Actually, it would be perfectly possible to use a single 5-pin connector for both the motor and the sensor. If you don't mind having the two units bound together by a sort of umbilical cord, you can do that. The line voltage outputs to the heater and circulation pump use standard wall outlets. For line power input, you can use a directly connected cable, or some kind of appropriate input connector. Make sure it's beefy enough to handle the 2kW power of the heater! Many connectors made for electronic equipment are not. There is also a DB-9 serial port. This is directly connected to a PC serial port. Using the software provided for free on the Parallax web site, you can load the software for the Basic Stamp without even opening the box. This is convenient specially to quickly add algorithms for new film processes you may want to run, or to tweak the parameters for some special kind of process. The software I'm using presently implements only the Tetenal 3-bath process for E6 slide films. I have three versions of it, for the first, second and third use of each batch of chemistry, considering the slightly longer process times in each consecutive use. The times are exactly those recommended by Tetenal, which works great for me, while the temperature is set one half degree higher than the nominal process temperature, to compensate for the slight cooling when taking the processing tank out of the water bath for filling in the chemistry. The temperature and times can be easily varied in the software. The box for this project was made from a single piece of 1mm thick aluminum sheet. It was cut and bend to the proper shape to form a slanted top and the side walls, complete with bent corners to attach the bottom cover. The entire box was spray-painted gray. Many of the parts, such as the transformer, perfboards, and most small components, came from my well-stocked junk box. I have an obsolete VCR there, several low density floppy drives (even some Ataris!) and other computer parts, and a large load of old communication equipment. In that way, projects such as these come cheap! The only expensive purchases were the Basic Stamp and the serial input display. They are really expensive, adding well over 100 dollars for the two. I think this is my last project using these devices. I'm now (mid of 2003) finally doing what I should have done a lot of time ago: Starting to play with bare-bones PICs and parallel input displays. They do essentially the same as the Basic Stamp and serial display, but cost only a fraction. Specially the PIC costs about one tenth of what the Basic Stamp costs! So, my next projects will be cheaper! - All metal parts of this machine must be bounded together. - The machine must be well grounded at all times. - The electrical circuit from which it is powered must have a ground fault interrupter of suitable sensitivity. - Before every use, you must check that the wires going into the water, very specially that of the line-powered immersed circulation pump, are in perfect condition. - Do not wet the controller while working. It's a good idea to place a clear plastic bad over it during use. Saran wrap is also great for this. Back to the homo ludens electronicus.